GUWAHATI: Haryana agriculture minister and former national president of BJP’s Kisan Morcha, Om Prakash Dhankar, said here on Friday that the Congress has “cheated” the farmers of Chhattisgarh, Madhya Pradesh and Rajasthanin the name of waiving off farmers’ loan. Dhankar on Friday attended a consultation meeting called ‘Kisan Ki Maan Ki Baat’ here with agriculture ministers, Kisan Morcha state representatives, agriculture officials of BJP and its coalition ruled states in Northeast for preparing BJP’s election manifesto for the Lok Sabha polls. Farmers’ loan waiver was one of the suggestions that came up during the meeting. When asked whether BJP will consider including the proposal of farm loan waivers in its manifesto like the Congress did in Chhattisgarh, Madhya Pradesh and Rajasthan, Dhankar said that what Rahul Gandhi promised as loan waivers for the farmers before the election, turned out to be completely different after Congress came to power in these states. “After Congress came to power, there were so many changes and conditions on loan waivers. There are notifications that clearly show that Rahul’s promise of total loan waivers was not kept. So I will not hesitate to use the harsh word “cheated”. 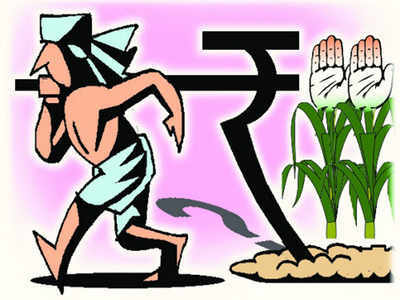 Congress has cheated the farmers of these states,” Dhankar said. Dhankar added that the BJP government at the Centre has launched the PM Kisan scheme though which farmers get direct income benefits. Under the scheme, farmers will get Rs 6000 per annum in three installments as an investment support. The first installment was launched by the Prime Minister Narendra Modi on February 24.